Directly opposite the beach, and with 180 degree views, this is a place to relax, put your feet up and enjoy life as it should be. With four bedrooms, sleeping up to 9 people in total, it is ideal for two families to share. With the living areas upstairs, this is a home where you can sit on the deck - or inside - and read a magazine or enjoy the views, or you can cross the road and have a swim or a walk, or play with the family on the sand. There is a fish cleaning bench, and an outside, rinsing off shower, for when you get back from the beach. The beach house has been set up for the children as well as adults. There are board games and books, as well as tv and a video player. There is an enclosed back yard. Mobile coverage is good, and the beach house has free wifi. Warm and comfortable, the house is set up to make the most of the wonderful position. The kitchen is neat and compact, with a dishwasher and microwave, and is well equipped with coffee plungers, a Nespresso machine, cooking utensils and plenty of cutlery and crockery. A BBQ on the deck will probably be the centre of activity in the evening. The house is close to the Ohope Club, where members of affiliated clubs can have a meal or a drink, or you can go to the village for coffee or a meal. The house is about equidistant between the village and the dairy/coffee shop at the port, where there is also a restaurant at the wharf. * This beach house is ideally suited to one or two families. * Guests are expected to leave the house as they found it, clean and tidy and ready for the next visitors. A vacuum cleaner and all cleaning materials are in the house. If a cleaner is required, this can be arranged at a cost of $65 extra. * No linen is provided. Please bring all sheets or sleeping bags, pillowcases, towels and teatowels, etc. * A hairdryer is provided. Easy living. Relax on the deck upstairs and watch the sea while someone tends to the BBQ! toilet, shower, Downstairs to service 2 bedrooms downstairs. Small and large Bodum coffee plungers; Nespresso machine. Upstairs deck with views to White Island and Whale Island. 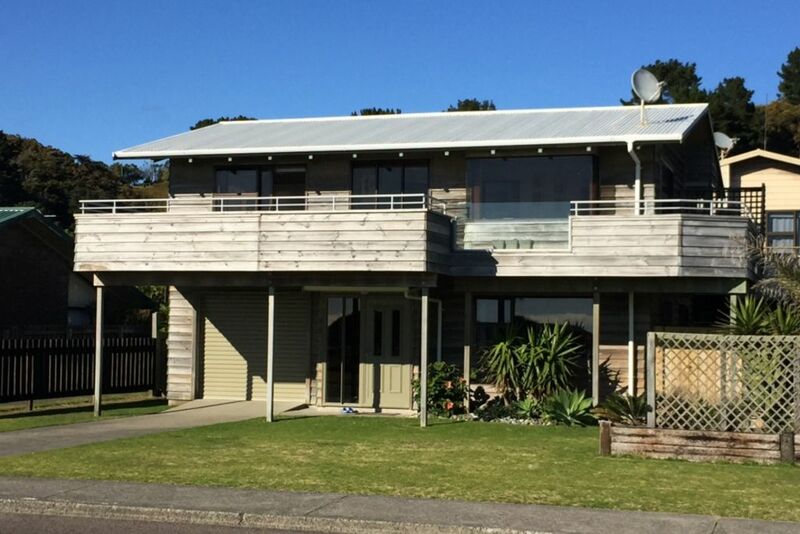 The house is located in a beautiful location (across the road from the beach) with beautiful views. The house is fantastic to stay at, everything you need is there. Very comfortable and relaxing to stay at. Love it!! Fantastic views, great seating inside and out. We loved the location, right over the road from the beach. The deck was lovely and we spent a lot of time sitting out on this enjoying the views. House was spacious. Had a great holiday. Another fantastic stay in a lovely location so handy to the beach. Fantastic weather while we relaxed on the deck and watched the waves rolling in. Safe beach. Loved the ease of the house it felt like home. Great location, lovely views and handy to the beach, shops and cafes. Well appointed and the layout suited two families really well. Lovely deck from which we could see the ocean and views over Whale Island. Great place to relax with a cold drink while the boys toiled over the BBQ! Highly recommended accommodation!